Have you ever wanted to jump up on a table and start tap dancing and then gracefully leap to the next table to continue your performance – then maybe take a run across the room and leap, then, landing in a sliding motion on a knee you have thrust out just for that… and as you slide have both arms out to receive the applause? Sliding a few feet on your knee is the last thing before the teacher snatches you up by the ear and marches you to the principal’s office. It happens. 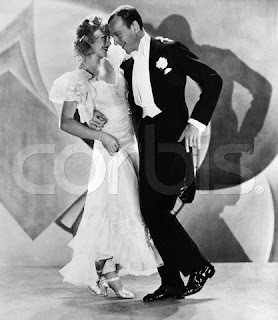 On this date in 1929, at age 18, Ginger Rogers makes her Broadway musical debut in Top Speed. If I did it now, I would certainly bust a hip. Or something worse. Great old movies. Every time Fred and Ginger come on TCM, I take the time to watch them. There is an Indiana Jones movie that opens up with a big rout-a-bout in a big fancy nightclub and a lot of sliding across the polished floor on your knees while the band goes wild. I would love to see that scene again. I think it was The Temple of Dome. Hoorah! No More Mud-Throwing! and BS Slinging!